Save 25% vs. paying at the gate! 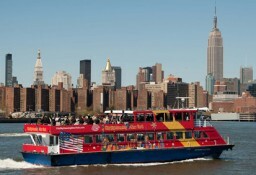 • CitySightseeing Hop-on, Hop-off Ferry tour with 2 hop-off points in Manhattan. • Admission to One World Observatory! 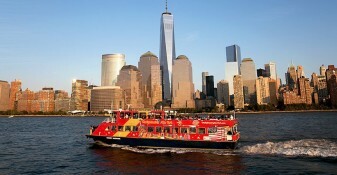 See New York City from every perspective with this unique tour package. 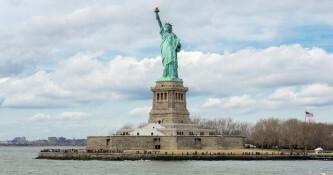 On your fully-narrated harbor cruise and tour of New York’s famed waterways, take in stunning views of the Statue of Liberty, the Brooklyn Bridge, South Street Seaport and many more iconic attractions. Hop-off locations at Pier 78 and the World Financial Center (get off here for One World Observatory!) make getting around easy and stress-free. There are a million things to experience in New York City, but only one way to truly see them all. Start by ascending to the top of the tallest building in the Western Hemisphere in less than sixty seconds, then look toward the horizon and feel the city’s invincible spirit. Take in the iconic sights, surrounding waters and panoramic views of the skyline and beyond. Explore three levels filled with innovation and inspiration. Immerse yourself in the bustling crossroads of the world at the See Forever Theater. Engage with City Pulse and our global ambassadors as they share stories of this amazing city. Step onto the expansive Sky Portal and take a walk high above the streets of New York. Start with an experience unlike any other. Start at One. One World Observatory. SEE FOREVER™. Admission to One World Observatory, an all-new attraction at the top of One World Trade Center, the tallest building in the Western Hemisphere. - 360-degree views from the tallest skyscraper in the Western Hemisphere!